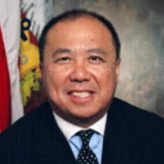 Edmund C. Moy has served as the 38th Director of the United States Mint since September 5, 2006. Moy graduated from the University of Wisconsin in 1979 with a triple major in economics, international relations and political science. For eight years, Moy worked with venture capital firms and entrepreneurs, including the private equity firm Welsh, Carson, Anderson & Stowe. During that time, he served on the boards of several companies and various nonprofit organizations. Following his career in finance, Moy worked as a sales and marketing executive for Blue Cross Blue Shield United of Wisconsin, and from 1989 to 1993, he served under President George H.W. Bush as a political appointee at the at the federal Health Care Financing Administration in the Department of Health and Human Services. As the director of the Office of Managed Care, he was responsible for regulating health maintenance organizations, formulating managed care policy and overseeing $7 billion in annual expenditures to Medicare and Medicaid managed health care programs. Moy was a special assistant for presidential personnel at the White House and was responsible for recommending top level cabinet members and political appointees for eleven cabinet departments and cabinet-rank agencies in the human services, natural resources, legal and national security areas. Moy was also responsible for senior political appointments for 32 federal agencies, including the Social Security Administration, Federal Energy Regulatory Commission, National Labor Relations Board and the National Endowment for the Arts. He served on the panel responsible for the Department of Homeland Security transition. He currently serves on the Board of Directors of the Tau Kappa Epsilon (TKE) Fraternity, Christianity Today International and the Christianity Today Foundation, a leading exponent of evangelical conservative Christian values and Bible-based teaching that was founded by Reverend Billy Graham.